There is no place more magical than the forest home of the Night Elves, bathed in an aubergine haze beneath a giant tree. Disclaimer: This was one of my first acrylic paintings, certainly my first landscape. I am totally cheap because I am using the paints you get for $0.89/tube at Michael's. Someday when my skill has improved I will invest in the nicer, more expensive acrylics. 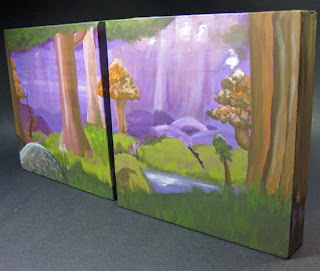 I achieved a cool panoramic effect by using two square canvases side-by-side. Normally these are supposed to be positioned vertically on a skinny piece of wall between two doors. I don't always do things the normal way. I started with a screenshot of Teldrassil on my computer monitor and then painting the scene on the canvas beginning with the background and layering my way to the trees and rock in the foreground, trying different techniques in order to make it look like the representation on my monitor. In case you happen to NOT be one of the millions who plays World of Warcraft and you are wondering "What the heck is Teldrassil? ", I am happy to inform you that tTeldrassil is a setting in the game. 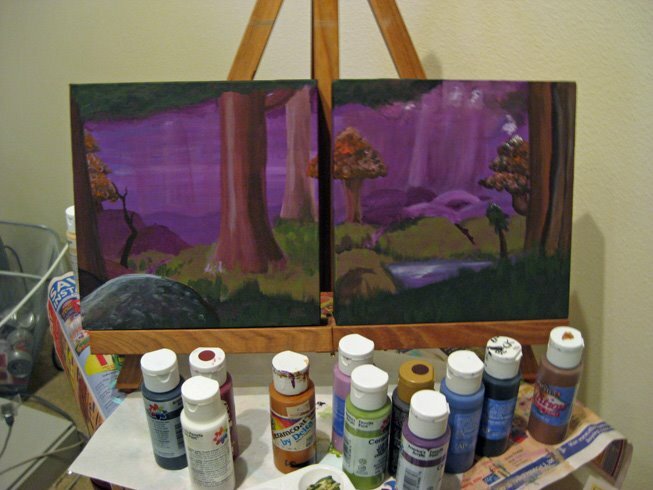 You get to frolic in this purple forest for your first 8-to-10 levels, if you start the game as a Night Elf like I did the first time I played it. Actually, my first Night Elf character was a Rogue named Avalyn. BTW Into the Woods is a really fun musical. If you ever get a chance to see it, go! I love the duet the princes sing, "Agony".